Aloe Vera, Aloe barbadensis, is called the “living first aid plant”. The gel of Aloe Vera leaves is used for many internal and external uses, including a tonic and for the treatment of cuts, wounds, bruises, scalds, cold sores, nappy rash, dandruff, sunburn and as after shave. Also known as:the Medicine Plant. 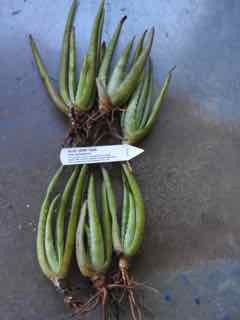 Aloe Vera is native of Africa and prefers light to medium, well drained soils in an open sunny position. Pale narrow leaves, yellow and purple flower. Drought resistant and tolerant of a light to medium frost. Evergreen plant, growing to 0.7m x 1.2m. Also available as potted plants. Be the first to review “Aloe Vera, pups dispatch Aug 2019” Click here to cancel reply.